Panzanella salads are like risotto or mussels– they never make you choose. You can make them 2305820935 different ways and through each of the seasons. This one is a Spring Panzanella Salad and it needed to be. I’m from Chicago and I know I should be able to handle the cold but it has just been SO COLD. I want Spring like I want to meet Ina Garten. Badly. I was about to IV asparagus straight into my body for want of Spring produce. Putting it in this salad seemed more reasonable. First step: cube up 8 cups of whole wheat bread (no crusts). 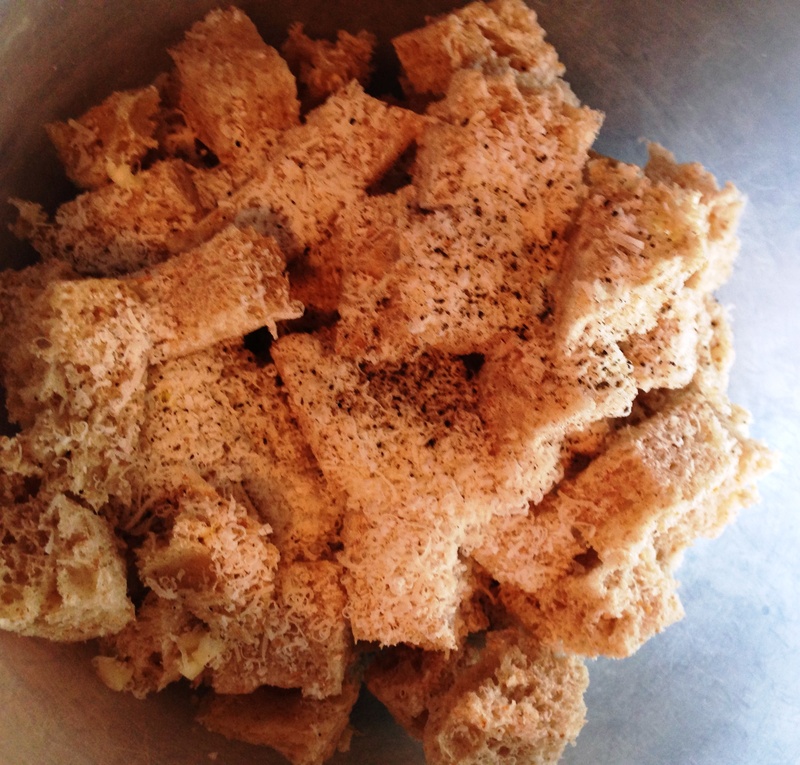 The original recipe calls for 6 cups but no human being ever has made croutons and not snagged one, two or ten of them during the salad making process so plan accordingly. Toss the bread with 0.25 cups olive oil, 2 garlic cloves (minced), 6 tablespoons of grated parmesan (I used pecorino because that’s what I had) and salt and pep. Spread on a baking sheet and bake at 400 for 10 minutes (toss once). This is the hardest part of the salad because you will want to eat all of these. Be careful or this might just turn into a Spring Salad sans Panzanella because you couldn’t keep your paws off the crouts. Whisk half of a red onion (diced) with 2 tablespoons of red wine vinegar, juice of half a lemon, 0.25 cups of olive oil and 0.5 teaspoons of Dijon mustard. Cut off the dark tops of four leeks and trim root ends. Halve each leek lengthwise but leave the root intact. Rinse. 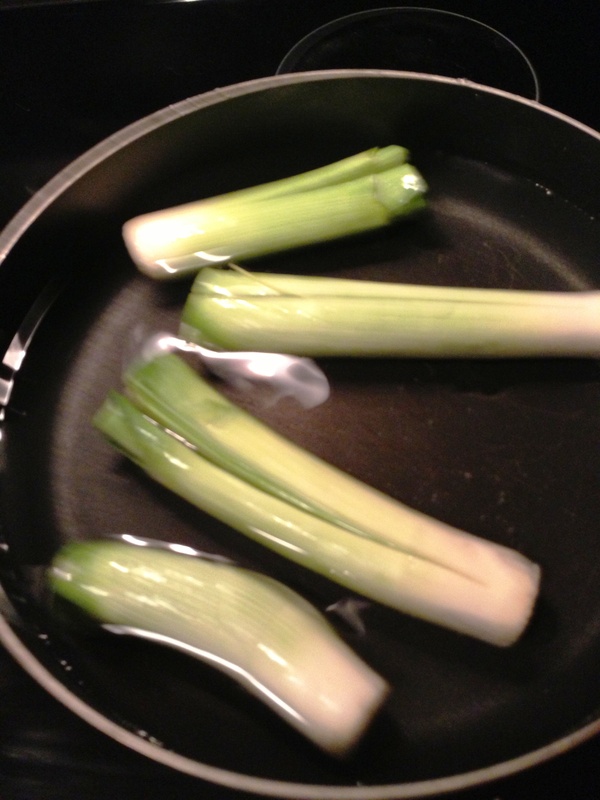 Place leeks in a 12-inch skillet and cover with water. Add salt and cook over medium heat for 15 minutes. If this sounds annoying to you (it is… it’s annoying and weird to cook leeks like this) you could use green beans, carrots or anything that you feel you deserve for having survived winter. Without draining the water transfer the leeks to an ice bath (ice bath keeps the leeks from looking brown and disgusting). Remove, pat dry, and slice. 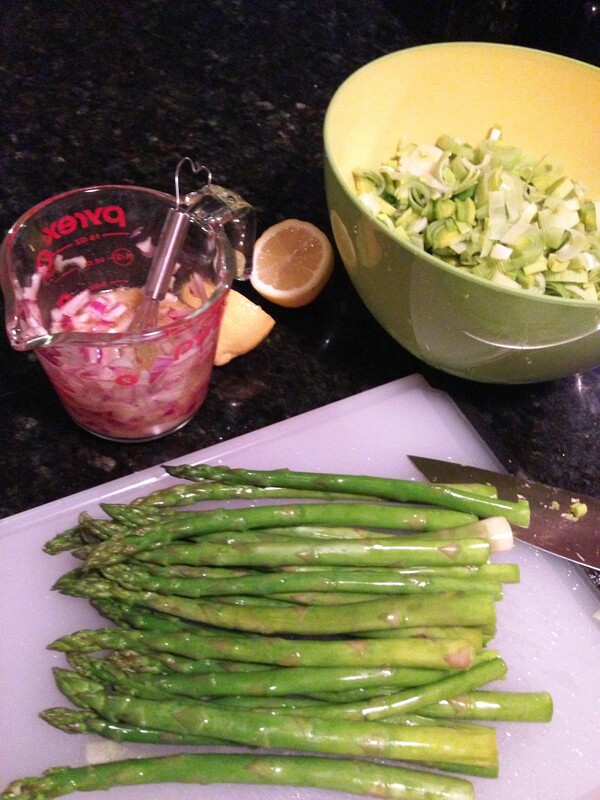 Place one pound of asparagus in the water you used for the leeks and cook until tender (3-4 minutes). Place into ice bath, drain and cut into one inch segments. 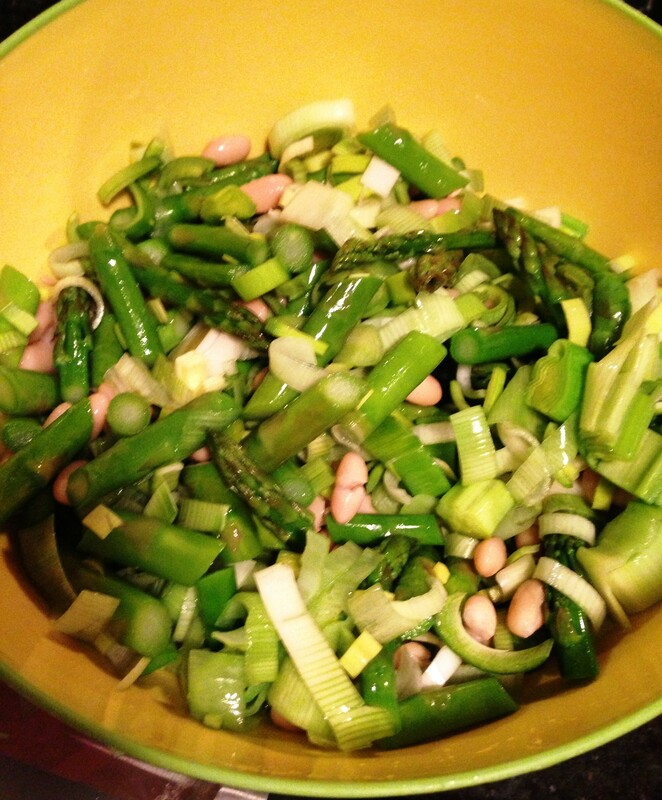 Toss the leeks, asparagus and 1 can of white beans (that you have rinsed and drained) in a large bowl. 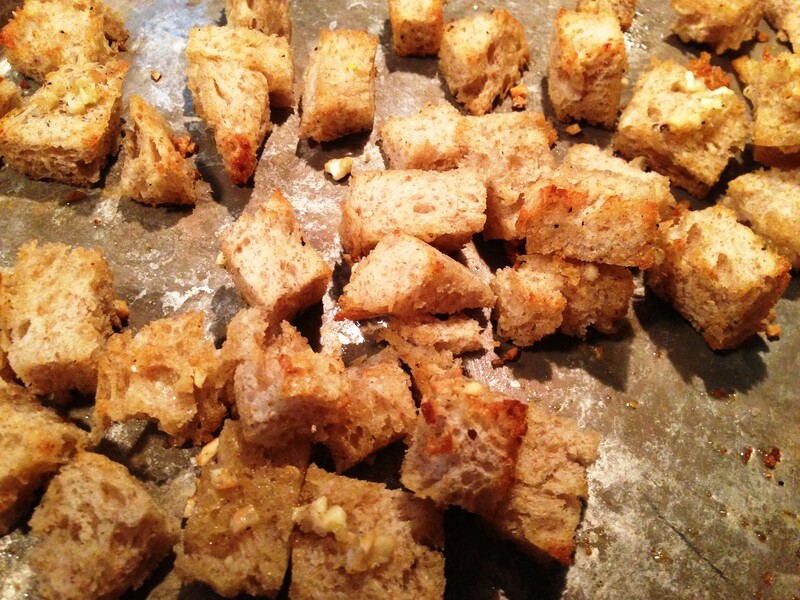 Add your cooled bread cubes that survived the salad making process. Toss with the dressing. Season with salt/pep and more grated cheese if desired. Eat until it’s 60 degrees or warmer outside.